Looking for a New Cadillac Escalade in your area? CarGurus has 977 nationwide Cadillac Escalade dealers with 11,290 new car listings. Tastes change when it comes to new-car buying habits-- but some things don't change. For luxury SUVs, the desire for spacious and opulent interiors, powerful engines, and refined appointments will always be in vogue. These are the defining characteristics of the Cadillac Escalade. Cadillac introduced the fourth generation of the Escalade for 2015 model year; it carried over with small changes year-over-year. An all-new Escalade is expected for the 2020 model year. The Escalade makes an imposing entrance at any scene. It’s massive waterfall grille is only rivaled by the LED taillights that go from bumper to roof. As previously mentioned, the Escalade now comes standard with a hands-free power liftgate. With your key fob on your person, simply swing your leg under the rear bumper of the Escalade, and it will automatically open the power rear hatch. This is incredibly helpful when your hands are full of groceries or luggage. The rear hatch opens up to a maximum 94.2 cubic feet of cargo space. With all seats up, the Escalade has 15.2 cubic feet behind the third row. Folding that third row gives way to 51.6 cubic feet. Trims for the Escalade include Standard, Luxury, Premium Luxury, and Platinum. 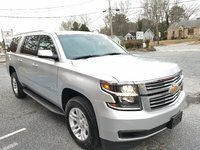 The Standard Escalade comes extremely well equipped, with 20-inch chrome-finish alloy wheels, active aero shutters inside the grille, power heated side mirrors, and assist steps along either side of the vehicle. Inside, the Standard Escalade features a 110-volt wall-style power outlet, Bluetooth connectivity, a Bose 16-speaker stereo system, and a 4G LTE Wi-Fi hot spot. The hot spot is subscription-based, good for three months or 3GB of data, whichever comes first. Other standard features include an 8-inch touchscreen with navigation, Android Auto, and Apple CarPlay. The Luxury trim upgrades to 22-inch wheels and adds a power sunroof, anti-theft system, automatic high beams, a driver head-up display, and power second-row bucket seats. It also adds a driver awareness package with a host of driver-assistance technology features. The Premium Luxury trim adds a rear-seat entertainment system with Blu-Ray and a DVD player, front-cornering lamps, illuminated door handles, and adaptive cruise control. The range-topping Platinum trim features unique 22-inch, 9-spoke alloy wheels with chrome inserts; power-retracting side steps; dual rear-entertainment screens; and 18-way power driver and front passenger seats with integrated massaging function. Beneath all the upscale appointments, a rugged vehicle lies beneath. The Escalade comes standard with a locking differential, magnetic ride control, and a standard 6.2-liter V8, making 420 horsepower and 460 pound-feet of torque. 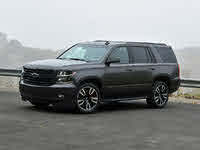 Power is routed through a 10-speed automatic transmission to the rear wheels; four-wheel drive (4WD) is available. When properly equipped, the Escalade can tow up to 8,300 pounds. The rear-wheel drive (RWD) Escalade returns estimated fuel economy of 14 mpg city, 23 mpg highway, and 17 combined. With 4WD, estimates stay consistent, at 14 mpg city, 21 mpg highway, and 17 combined. Highway economy is a little worse, but there is minimal penalty for selecting four-wheel drive. Standard safety features on the Escalade include front- and side-impact airbags, front-and-rear parking sensors, a tire-pressure monitoring system, Teen Driver System, and surround-vision 360-degree monitor. The base trim also features the innovative safety-alert seat, which vibrates the portion of the driver’s seat that corresponds to the side of the vehicle that the alert is on. Moving up to the Luxury trim adds rear cross-traffic alert, an external washer for the reversing camera, forward-collision alert, lane-change alert, and lane-departure warning. The Premium Luxury trim adds automatically tightening seat belts, forward automatic braking, and reverse automatic braking. The Escalade is big on space, but also big on luxury features. From the well-equipped base trim up to the lavish Platinum, the Escalade keeps pushing the limits of the luxury SUV. 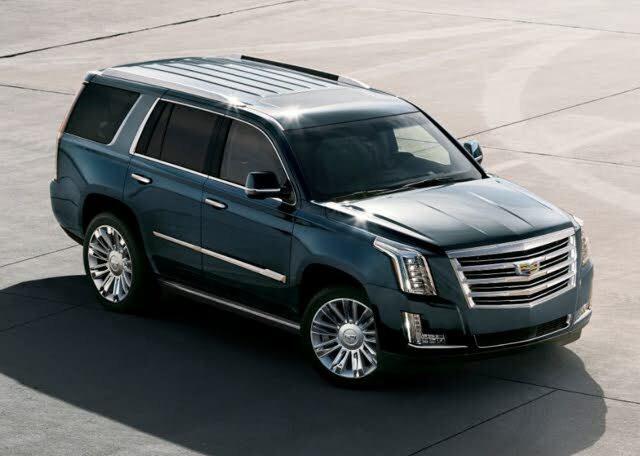 What's your take on the 2019 Cadillac Escalade? Have you driven a 2019 Cadillac Escalade? Enter your zip to see incentives for a new Escalade in your area. CarGurus has 11,409 nationwide Escalade listings starting at $1,999.